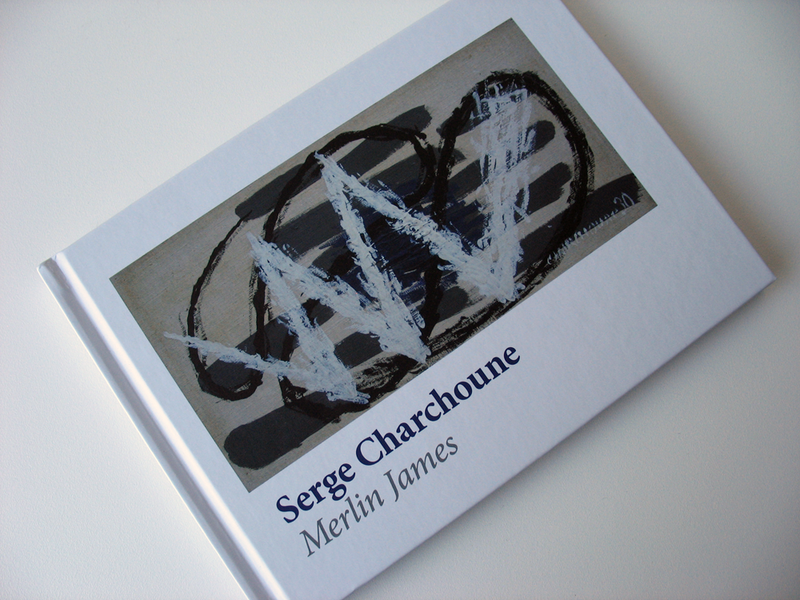 A book about the work of the Franco-Russian painter Serge Charchoune, which was published to coincide with an exhibition of Charchoune's work that was shown in Edinburgh and Chicago. 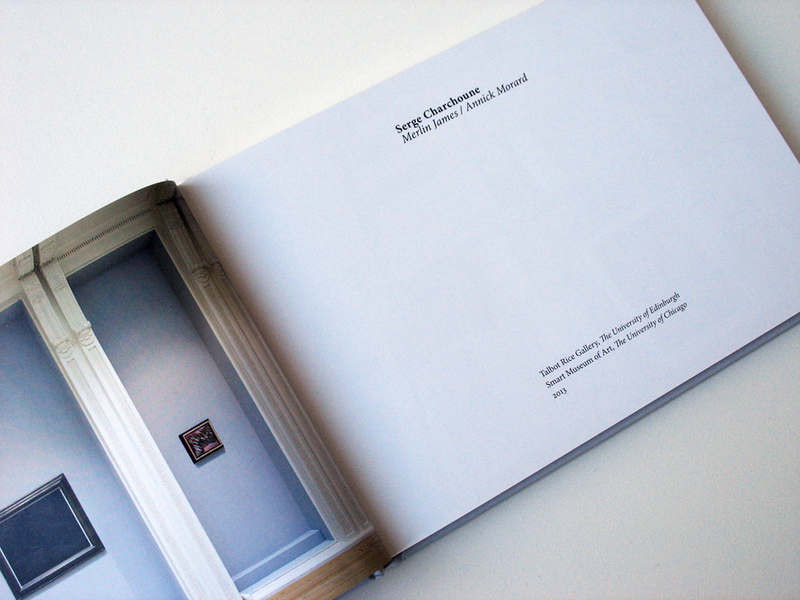 The exhibition was curated by the Glasgow-based artist Merlin James, who was keen that the book mark a new level of scholarship around this under-researched figure, providing an in-depth critical analysis of Charchoune's career and documenting the exhibits in catalogue raisoneé detail. 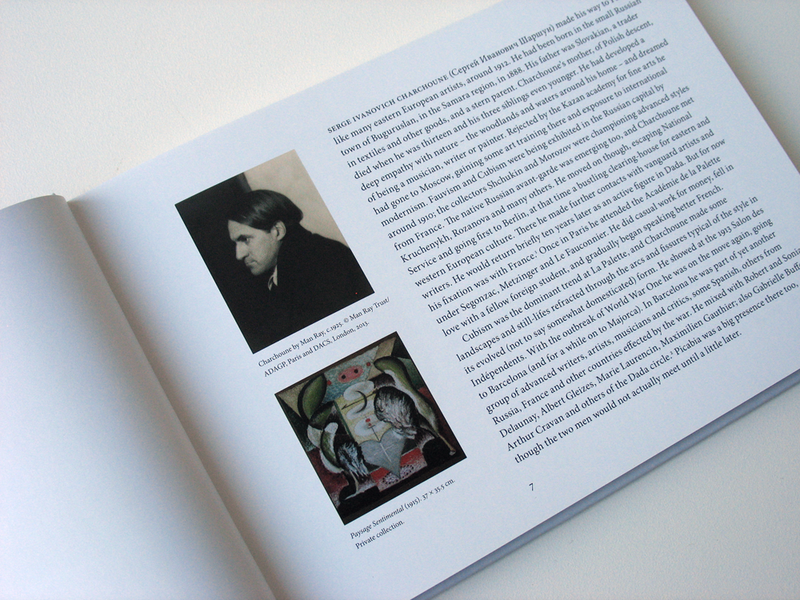 I developed a design based on the visual language of the catalogue raisoneé, that ordered Merlin James' extensive research for each painting in the exhibition in a rationalised and accessible manner. 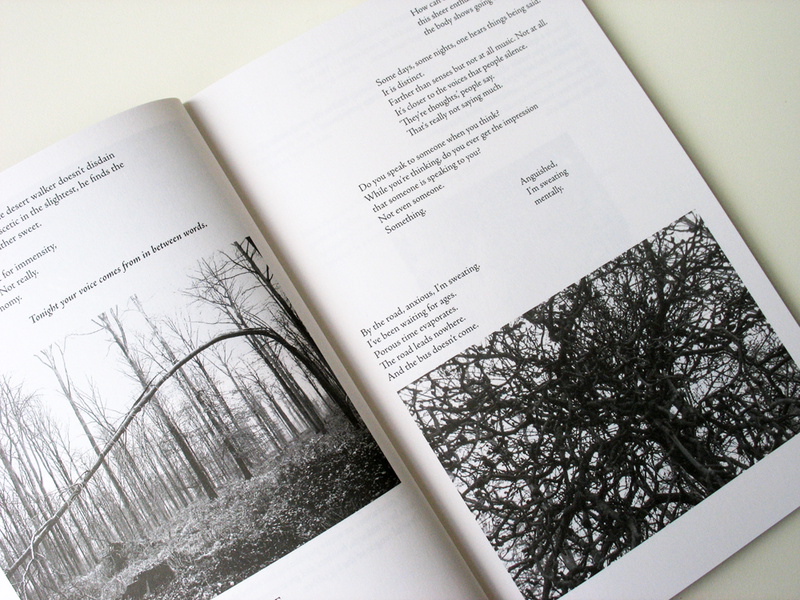 Two illustrated essays by Merlin James and Annick Morard contextualise Charchoune's work, and gave me the opportunity to develop a playful rhythm with the positioning of images within the text. 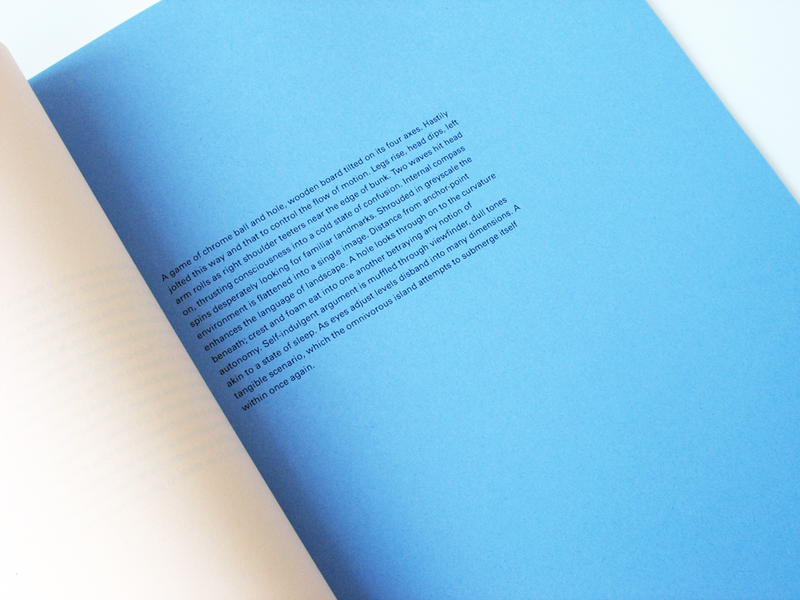 The book was printed on Hello Silk and was casebound with a matt grey cover complete with Royal Blue endpapers, giving a sense of a book that was slightly out of time. 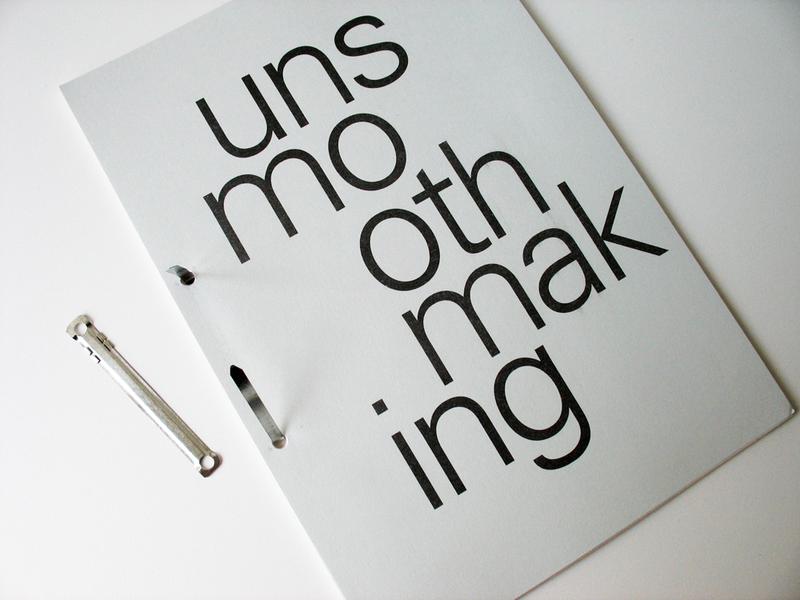 unsmoothmaking is a publication that accompanied an exhibition at Transmission Gallery, Glasgow, and that documents a month long artists' residency in October, 2012, at the artist run initiative Lothringer13_Laden in Munich. Psykick Dancehall, Giuseppe Mistretta and Sarah Forrest presented new video works at Transmission; the exhibition opened with the launch of the publication on 15 June. 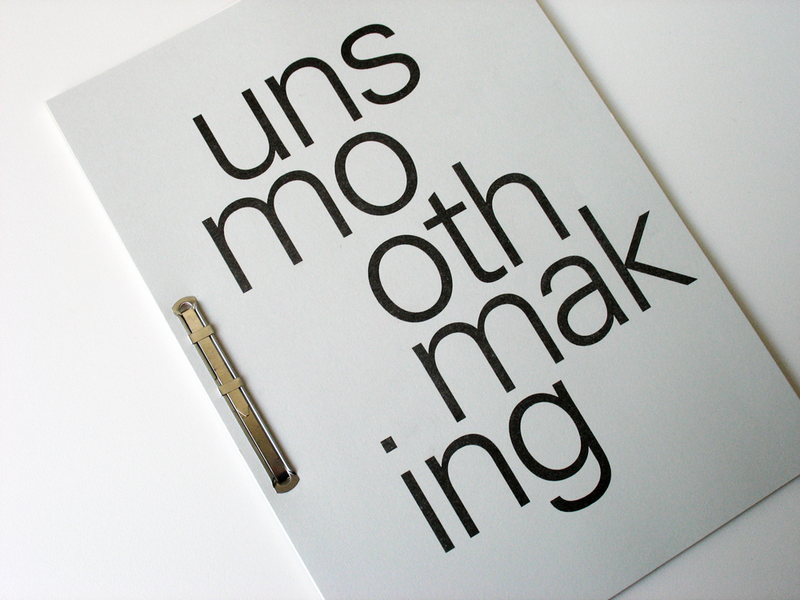 unsmoothmaking is a collaborative work that operates as a guidebook or manual for future spoken word performances, some of which were presented throughout the opening afternoon event. 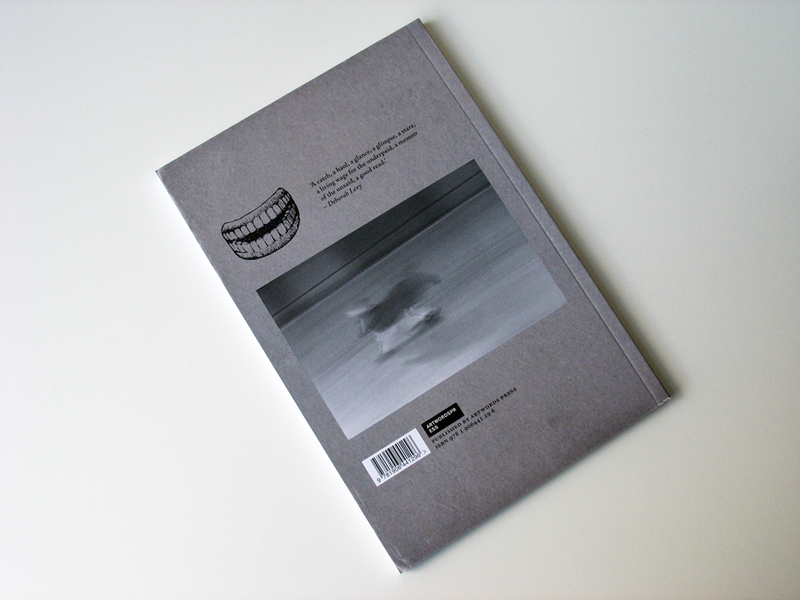 The publication was launched at Lothringer13_Laden on the 22 June. 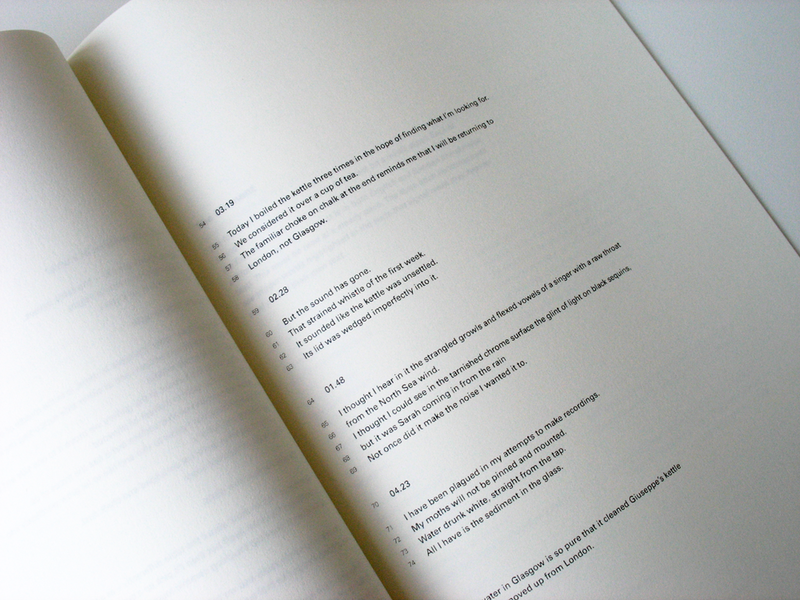 The publication was printed digitally at Clydeside Press in Glasgow and is designed to be taken apart, with loose pages held with a metal paper fastener; the pages are A4 on various coloured paper stocks; they can be photocopied and distributed for performing the texts within. 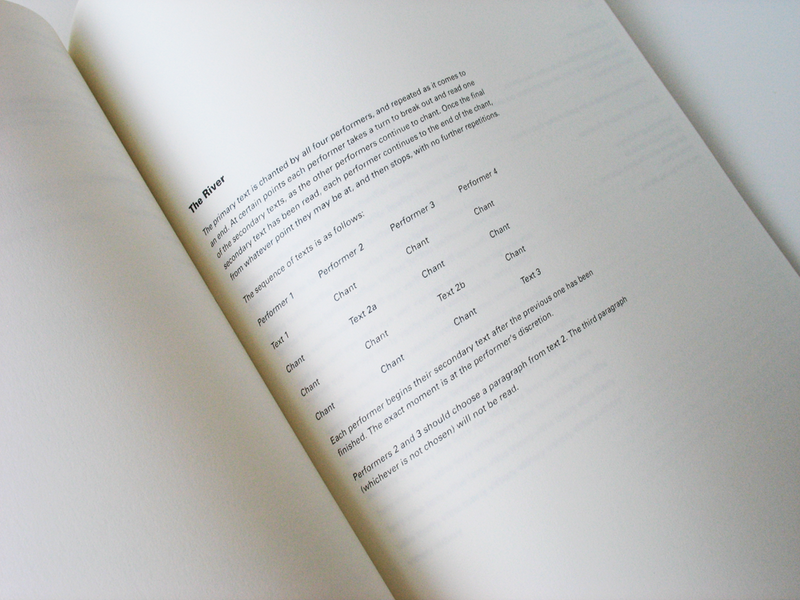 The proofs arrived today for Eight Blocks or a Field, the publication that I have been designing for the Glasgow-based artist Kate Davis. 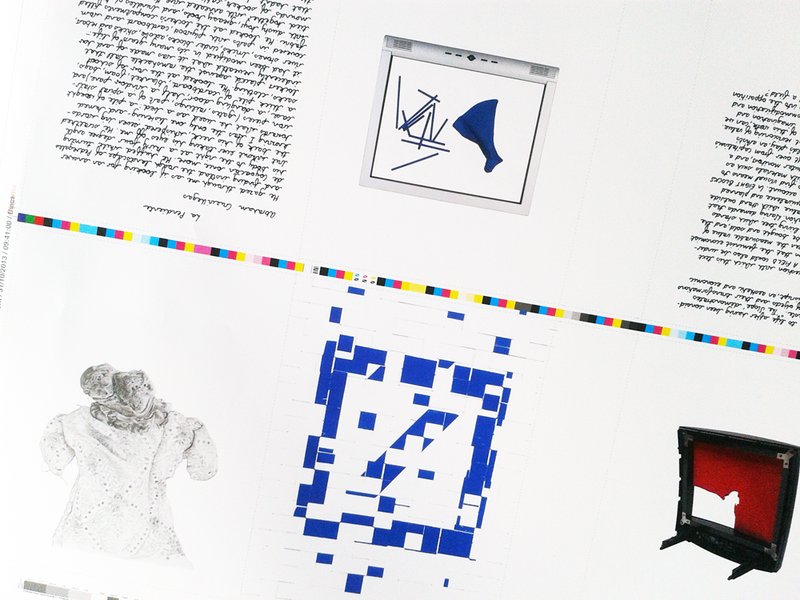 Eight Blocks or a Field is being printed by Allander, in Edinburgh; we were able to make a few final adjustments before it went to press. 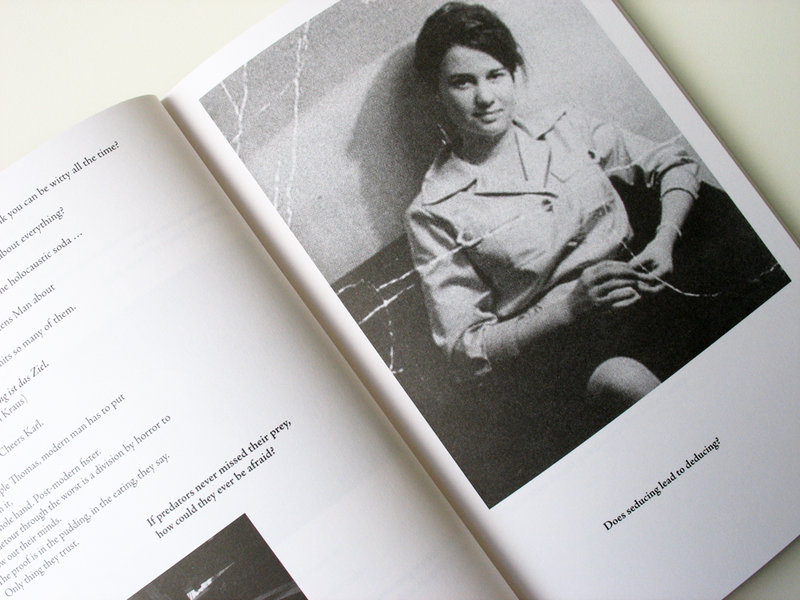 The book will be ready for a launch at Temporary Gallery in Cologne, to mark the end of Kate's exhibition there. 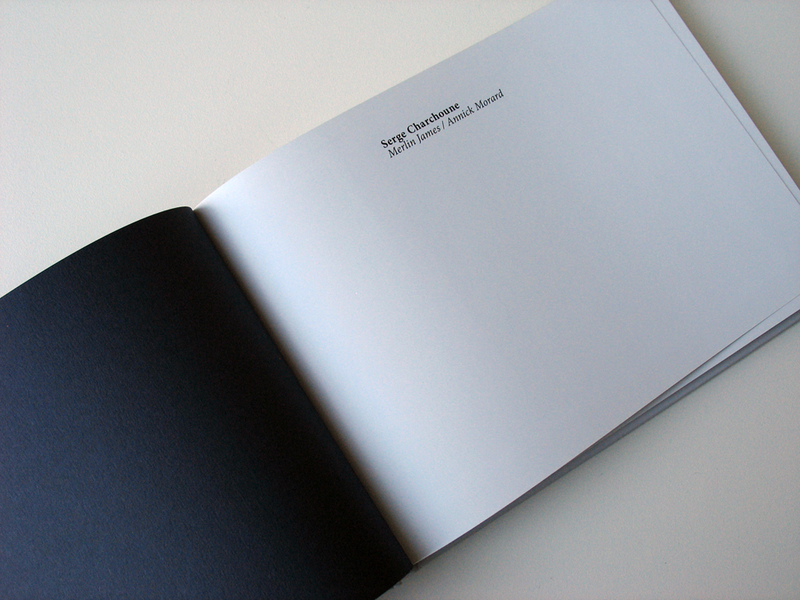 Book Launch and Artist Talk with Kate Davis at Temporary Gallery, Mauritswall 35, Cologne, 16 November, 2-3pm. Exhibition ends 17 November 2013. 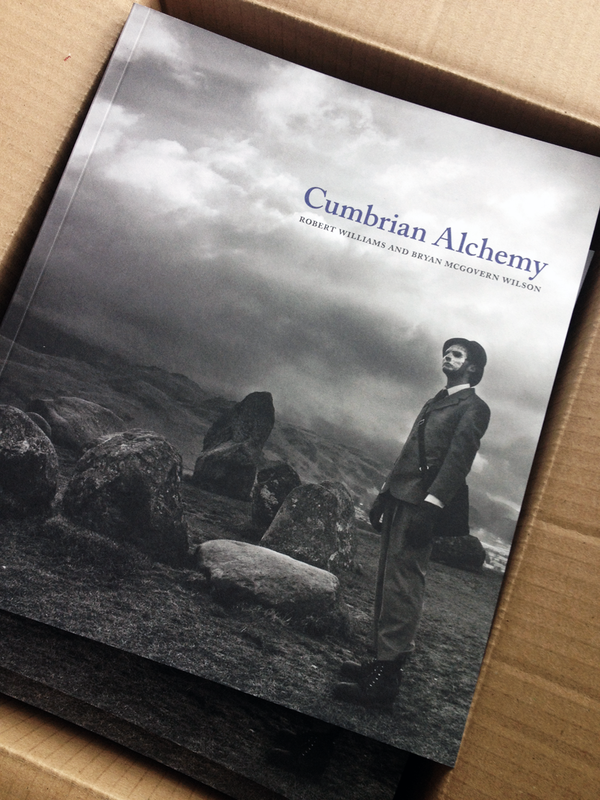 Very excited to finally see finished copies of Cumbrian Alchemy, the book I have been working on with Robert Williams. 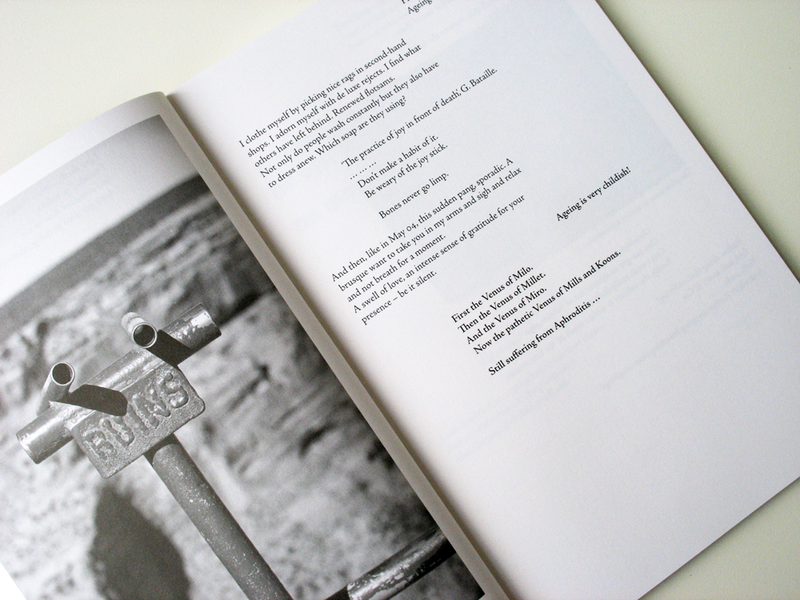 The book is an outcome of an Arts Council funded project of the same name by Robert Wiliams and American artist Bryan McGovern Wilson. 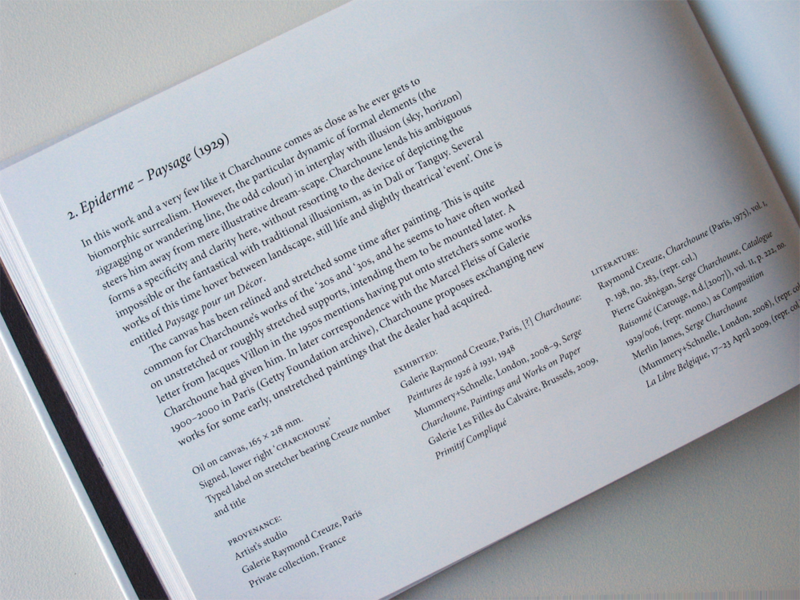 The book was printed by Allander in Edinburgh - they have done a great job! 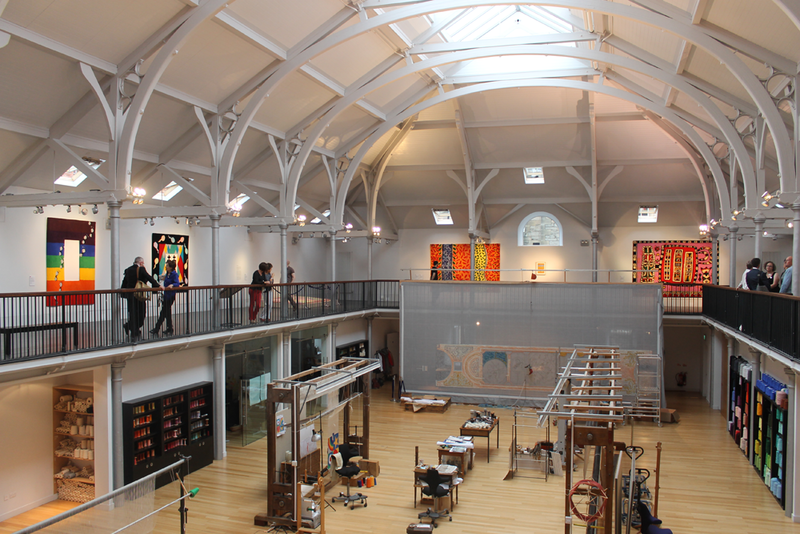 Dovecot Studios is a one hundred year old tapestry studio, homed in a renovated Victorian swimming pool in the heart of Edinburgh. 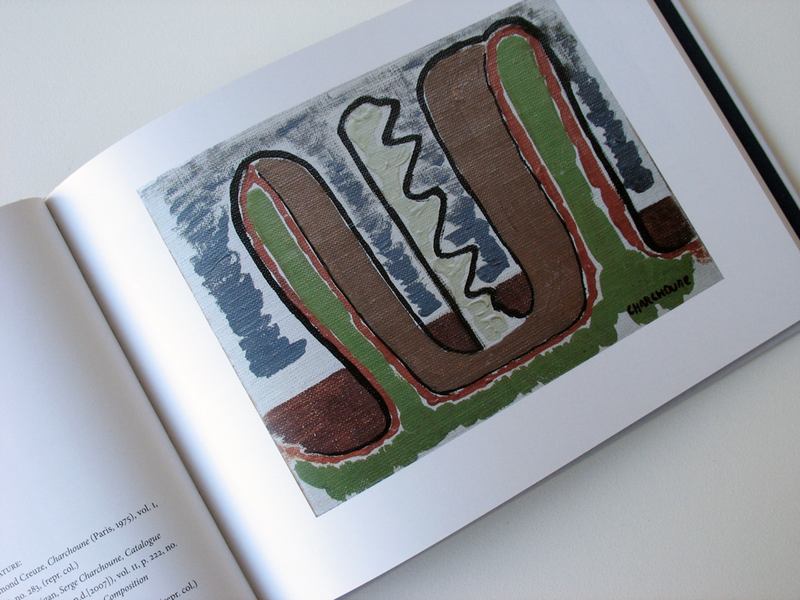 The studio has a long established reputation as a leading contemporary fine art tapestry studio, producing tapestry and rugs for private and public collectors. 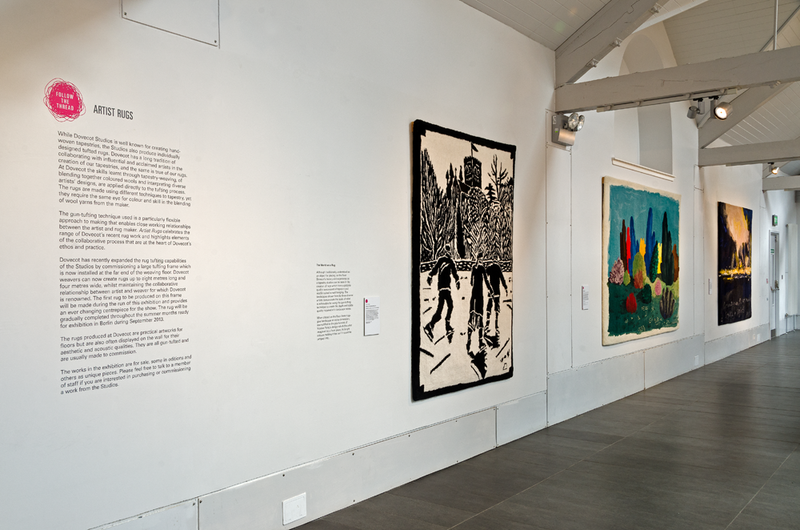 Dovecot Studios presents a programme of exhibitions that embraces tapestry, craft, photography, and contemporary art, displayed in beautifully-designed gallery spaces. 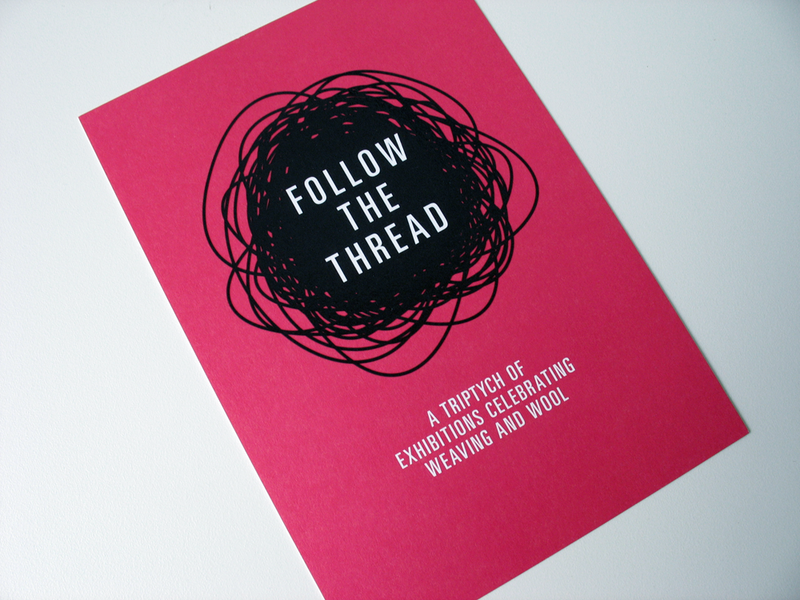 I was invited to create an identity for Follow the Thread, Dovecot Studios' 2013 Edinburgh Art Festival exhibition. 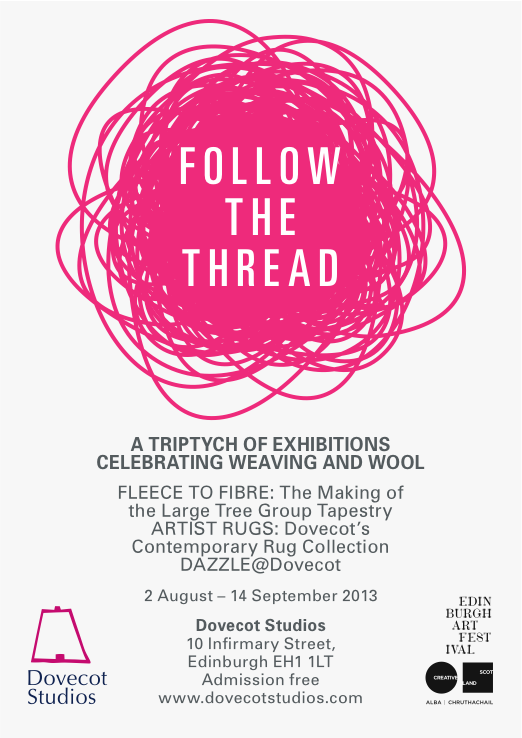 Follow the Thread was a celebration of weaving and wool, with three distinct exhibitions: Fleece to Fibre: The Making of the Large Tree Group Tapestry; Artist Rugs: Dovecot’s Contemporary Rug Collection; and Dazzle@Dovecot. 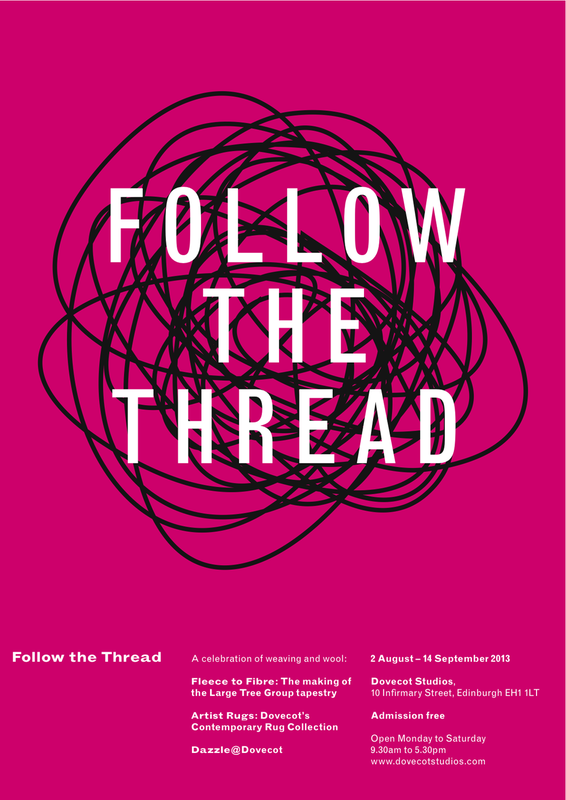 The exhibition ran from 2 August – 14 September, and was accompanied by a series of events, performances and talks. 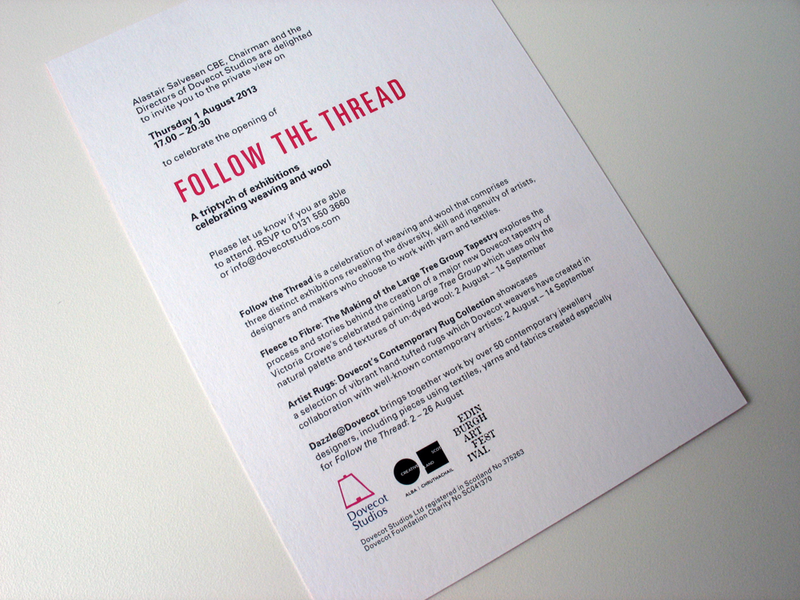 The brief was to create an overall identity for Follow the Thread that linked all three exhibitions together. The identity needed to be attractive and vibrant, working across different media and at different scales, online and in print: invitations, leaflets, posters, and banners. 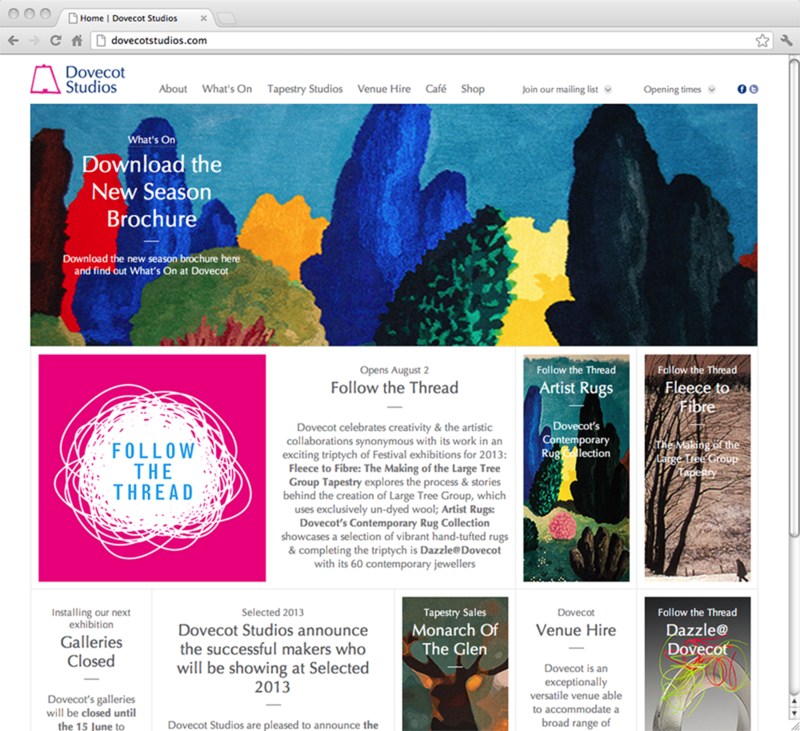 The identity had to appeal to Dovecot Studio’s present audience – but, crucially, had to appeal to a new, younger audience, to develop and expand Dovecot Studio’s core audience. A second part of the brief was to extend the identity to the exhibition graphics, designing vinyl signage, labels and wall panels for the three exhibitions. 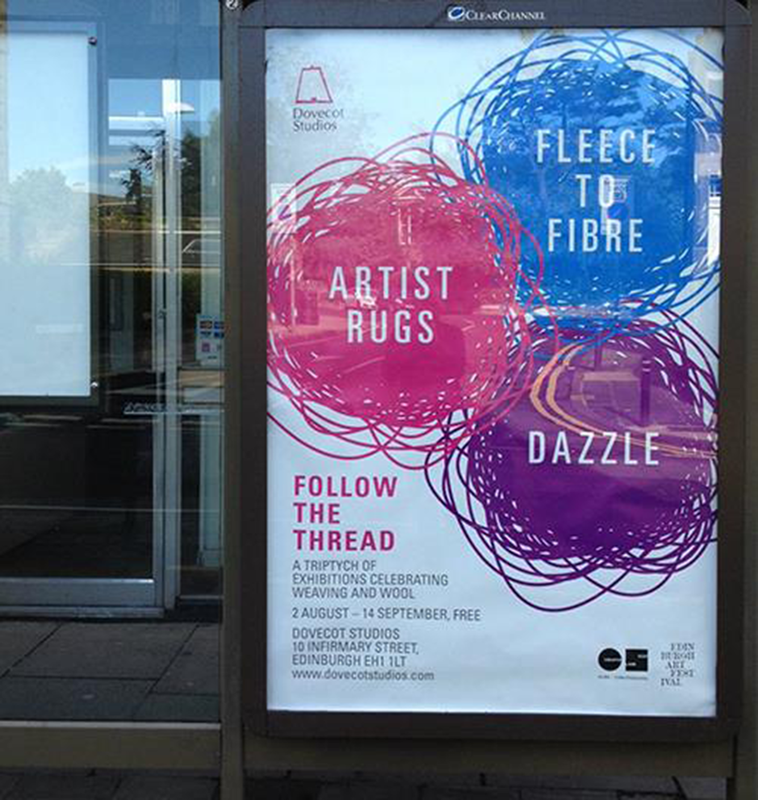 A further part of the brief looked at the problems of wayfinding within Dovecot Studios and I was asked to devise a series of vinyl signs that would direct visitors to the three exhibitions, particularly Artist Rugs, which was on the balcony gallery, up several flights of stairs. 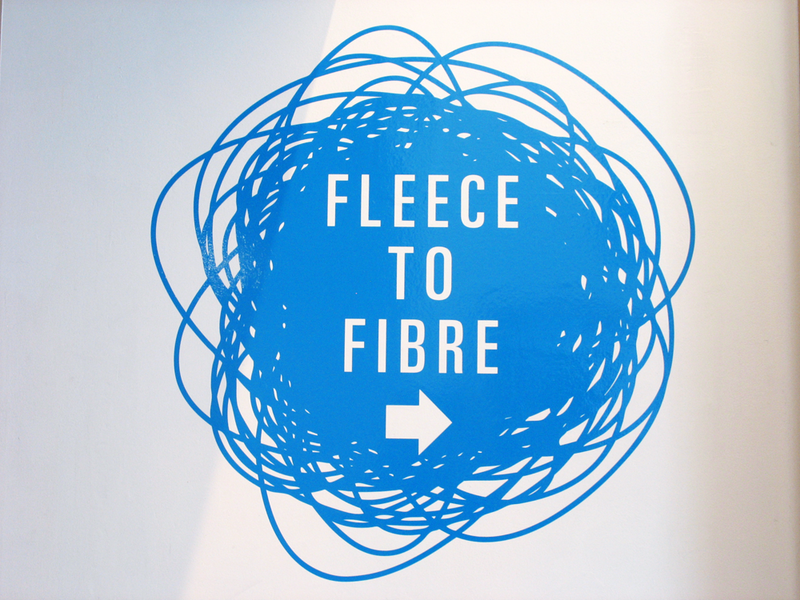 The identity was developed in collaboration with Ben Divall, the external curator of Fleece to Fibre and members of the team at Dovecot Studios: David Weir, Director; Sandra Crow, General Manager; Gary Smith, Marketing Manager; and Kate Grenyer, Exhibitions Coordinator. After an initial conversation with the team about ideas for the project, I came back with three distinct design concepts for the identity. After much discussion, we settled on the ‘scribble of thread’ as the strongest solution, and one which could work well across all three exhibitions. 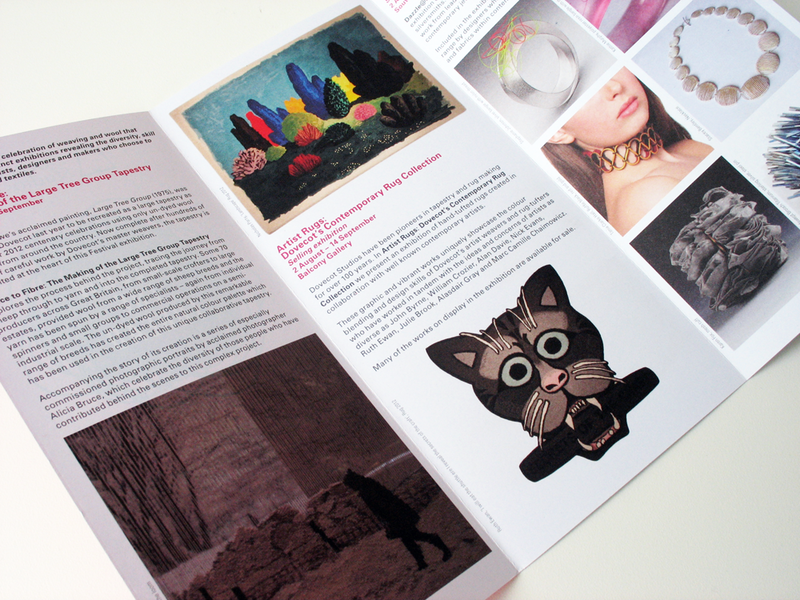 Using the pink and blue of Dovecot Studio’s existing identity as a starting point, I developed a colour palette, with one key colour for each exhibition supplemented by rich black and 60% rich black throughout. 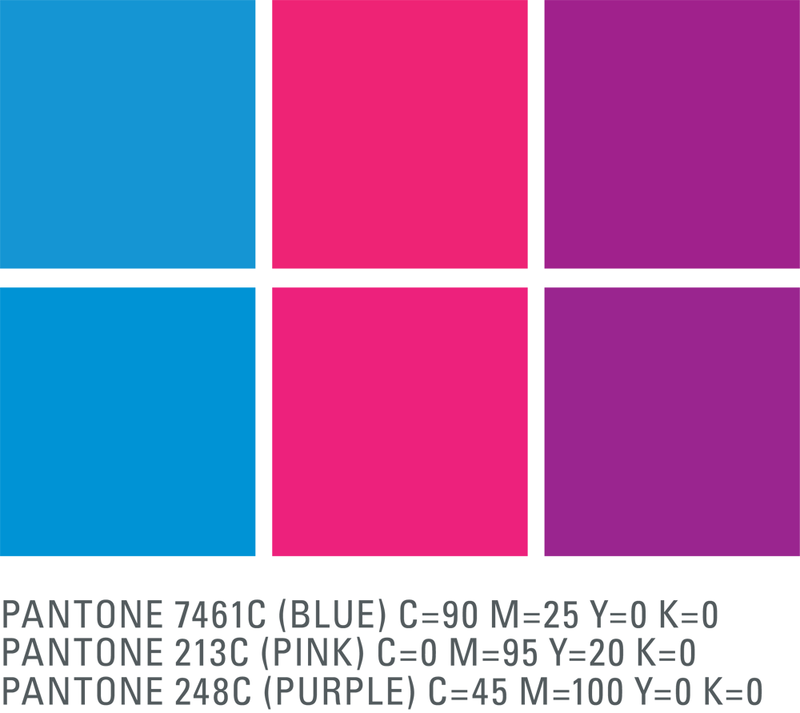 The colours had to be tonally very similar so that one colour did not dominate. Although I initially experimented with ‘electric’ colours, I finally settled on slightly muted, perhaps more ‘natural’ colours, but still vibrant and eye-catching. 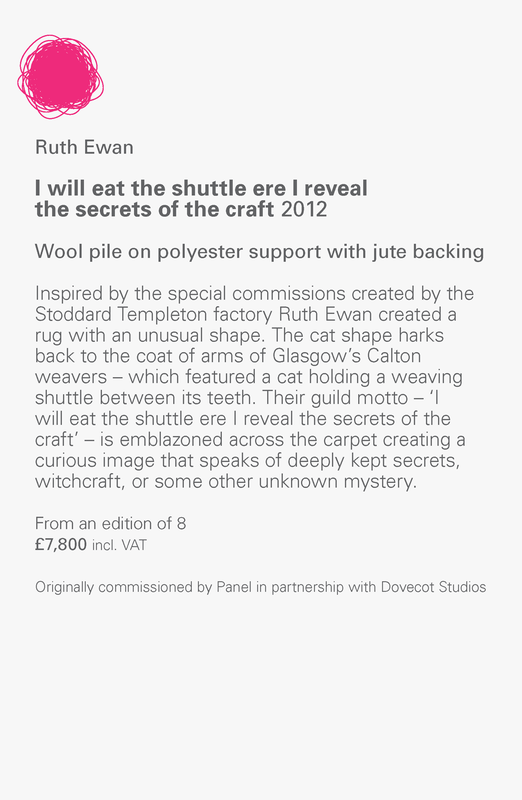 A stipulation of the brief was that I had to use Dovecot Studio’s logo, which is set in Optima typeface. 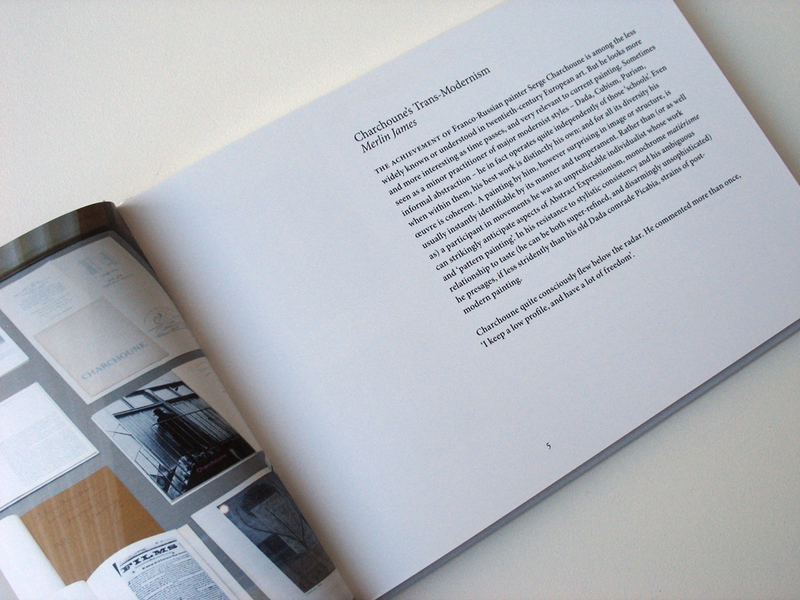 I decided to use Univers as the typeface throughout my identity as it works well with Optima, and also brought a new freshness that carries connotations of Modernity, encapsulating Dovecot Studio’s relationship with craft and Modernism. 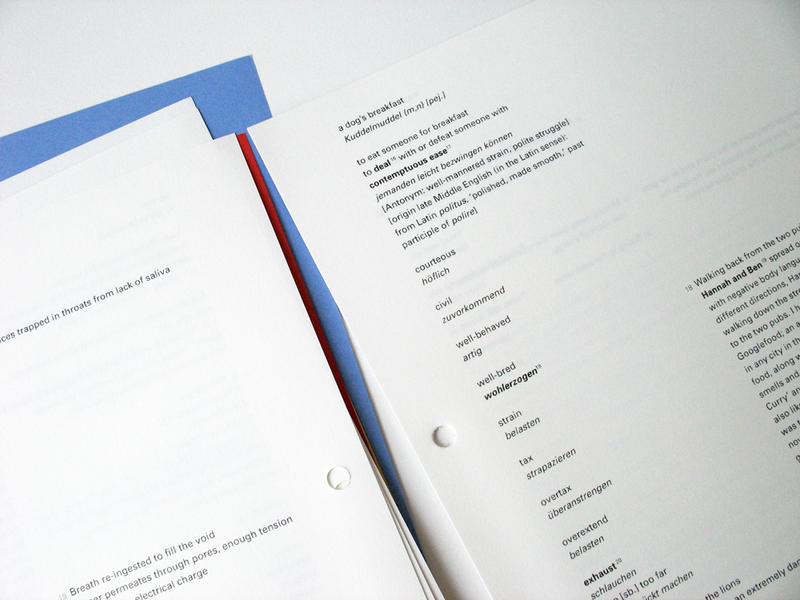 In addition, Univers, designed by Adrian Frutiger in 1954, is a large type family with multiple widths and weights that maintains a unified, rationalised design throughout, so the ultra condensed version that I used for the titles of the exhibition unites well with the regular body text. 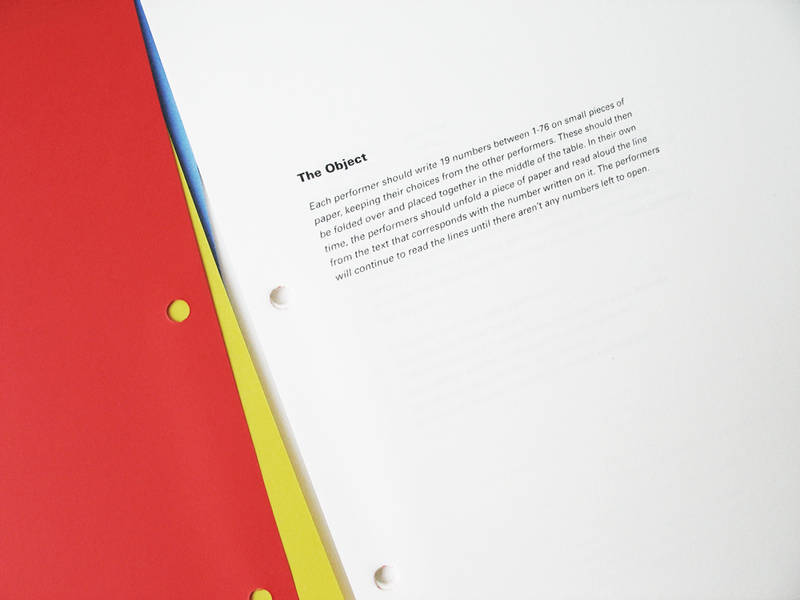 Further refining of the identity, again in collaboration with the team at Dovecot Studios, gave me a ‘kit of parts’ that I felt confident could be used in different ways across the many parts of the brief. Once the identity was established, the most important thing to be designed was the invitation card, as this needed to be mailed out. 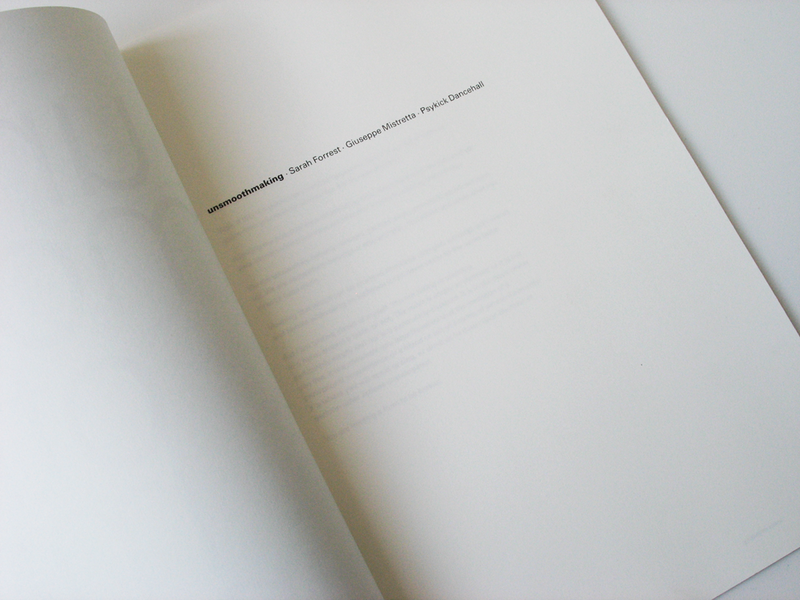 The card was printed by Allander, Edinburgh, on Zen Pure White 350gsm, 210 x 148mm, with a double-hit UV spot varnish on the scribble logo. 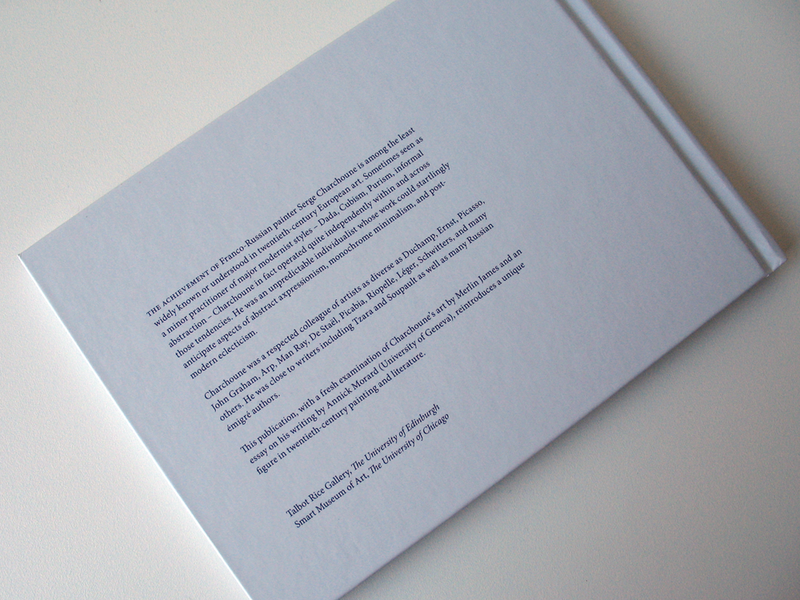 The reversed out white lettering was left unvarnished, adding a pleasing extra level to the finished printed card. 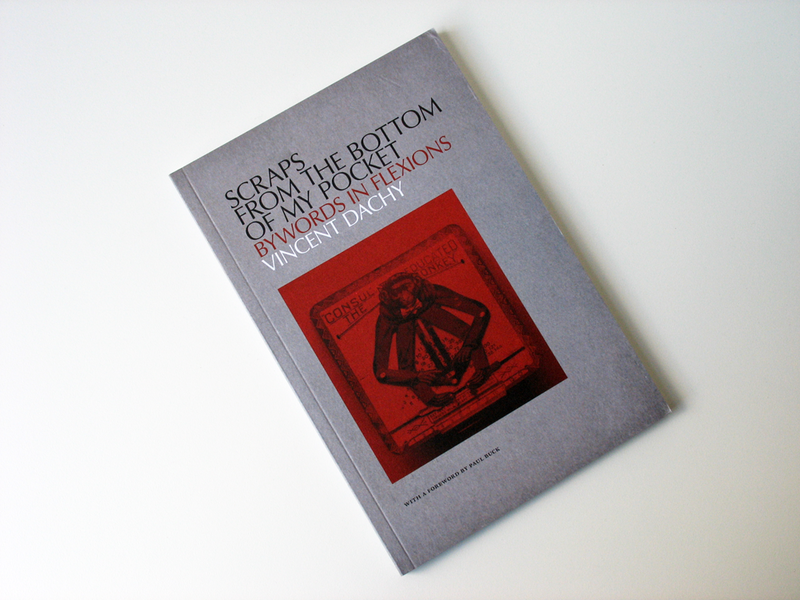 I was pleased that I had been able to persuade the gallery to spend a little more on good quality card and on the spot varnish: these small details made a big difference, suggesting that this was an important exhibition that had to be seen. 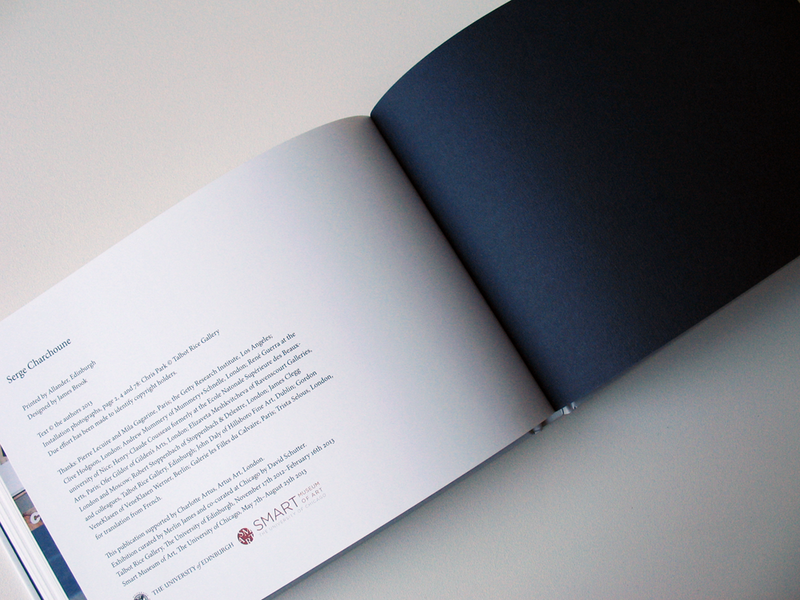 The leaflet developed the theme of the invitation card but was printed on a far more economical paper and without the UV spot varnish. 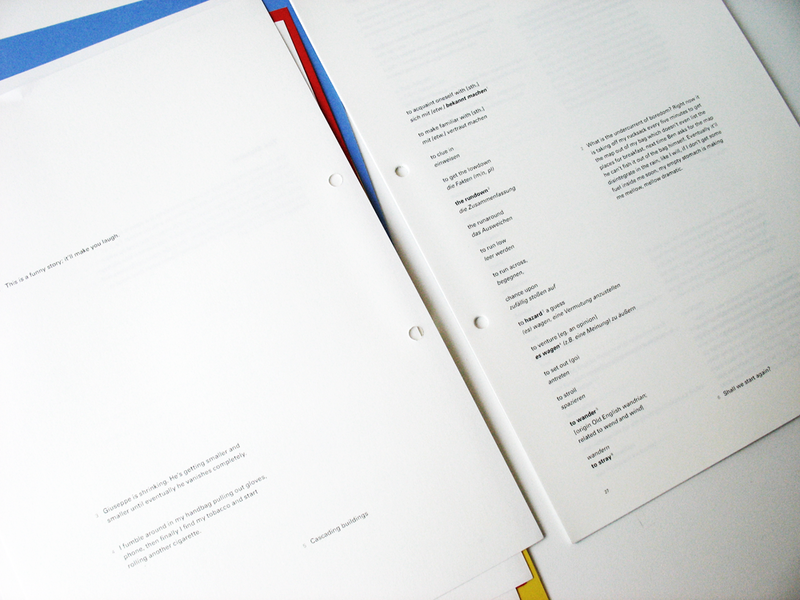 It was printed by Allander, Edinburgh, on Revive 100 Offset 150gsm, full colour, 210 x 297mm, letter folded to 210 x 99mm, 6 pages. 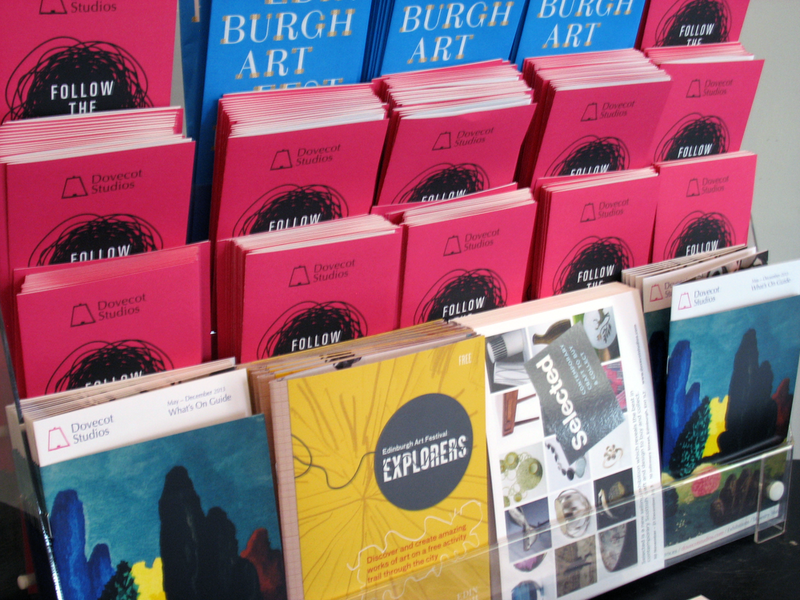 Printed in an edition of 5,000, the leaflet appeared in Edinburgh and further afield, its pink cover sitting nicely with the yellow of the Edinburgh Art Festival leaflet. 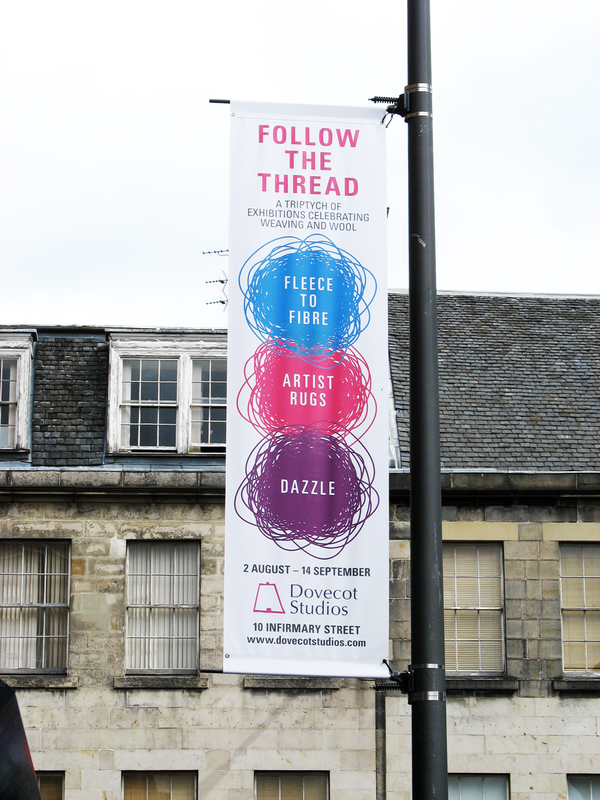 The banners were produced by McRobb in Edinburgh, and were hung on the corner of Chambers Street and Nicholson Street, close to Talbot Rice Gallery and the National Museum of Scotland. 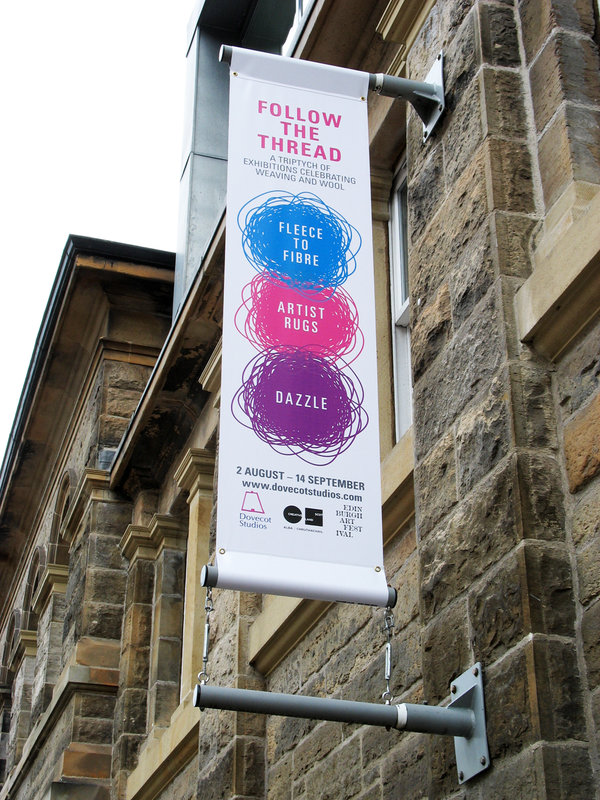 A further banner was hung outside Dovecot Studios. 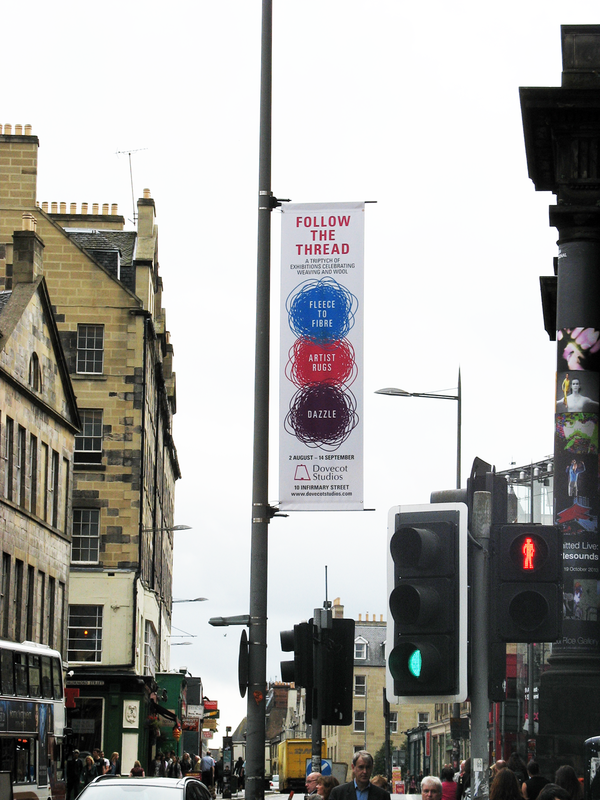 I decided that the banners should be designed on a white background so that they would stand out from the dark stone of that particular area of Edinburgh. The vertical format of the banners, 2800 x 750mm, decided the layout: I used the scribble logo, rotated, in the three colours of each exhibition in a vertical alignment. This arrangement was reminiscent of traffic lights, and made a very arresting image, that shone out in this dark corner of the city. 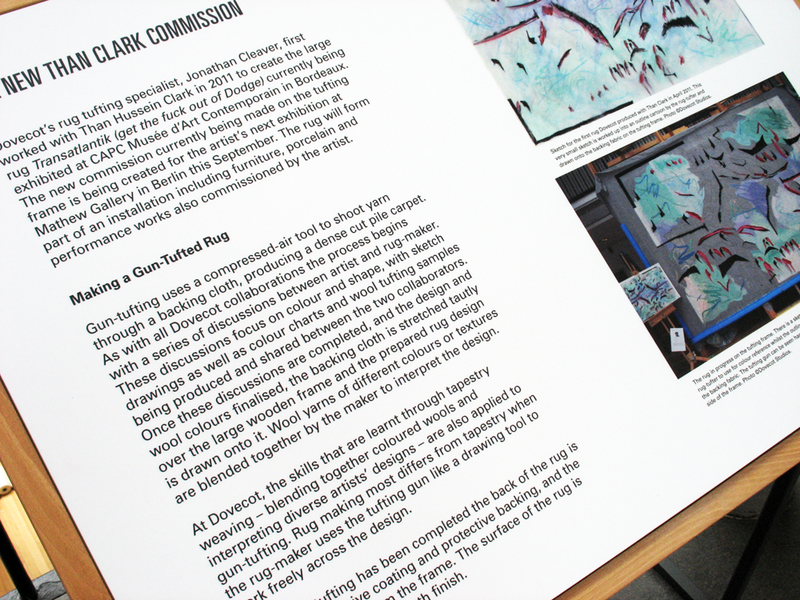 The banner design was reformatted for some press advertisements that appeared in Crafts magazine and Scottish Field. 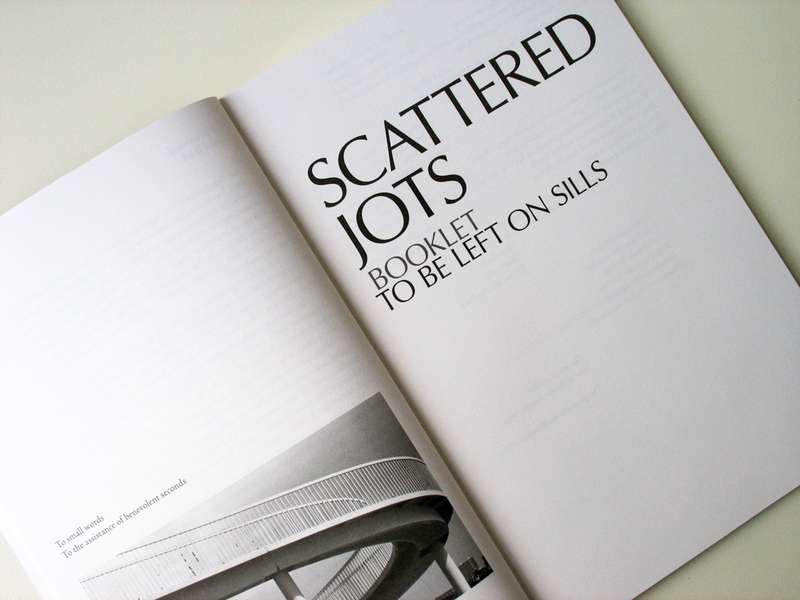 The advertisements are a good example of how the ‘kit of parts’ could be reassembled in different formats for different media, whilst maintaining a consistent identity. 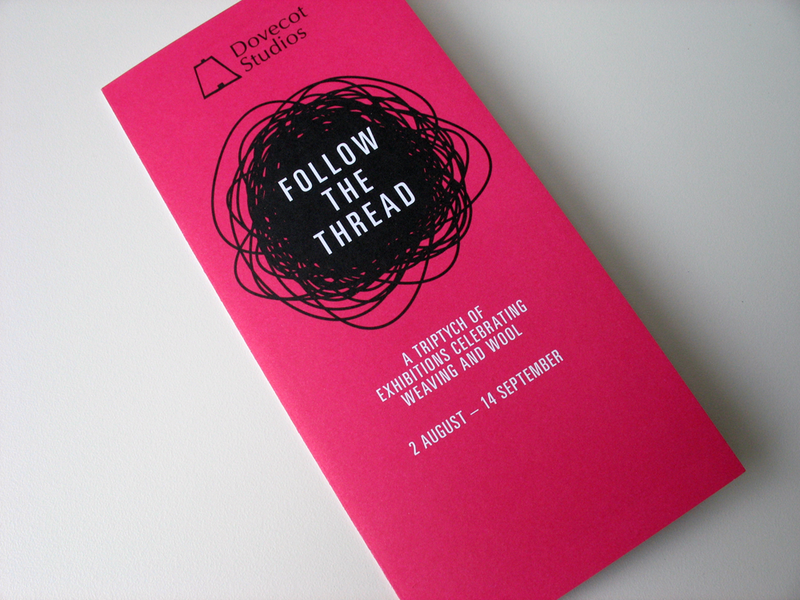 Dovecot Studios produced a run of A3 posters that were mailed out to venues and organisations throughout Edinburgh and beyond. My design was reformatted from the design of the banners, with the three scribble logos interacting playfully with each other in a dynamic triangular formation. I was delighted to be asked to design a six sheet poster that appeared on bus stops in various locations across Edinburgh. Sadly, I did not manage to see any of the posters in situ, though they were spotted by many friends and were, apparently, very distinctive and highly visible. The posters were designed to Clear Channel’s specifications, at quarter size, 300 x 450mm, with finished posters printed at 1200 x 1800mm. 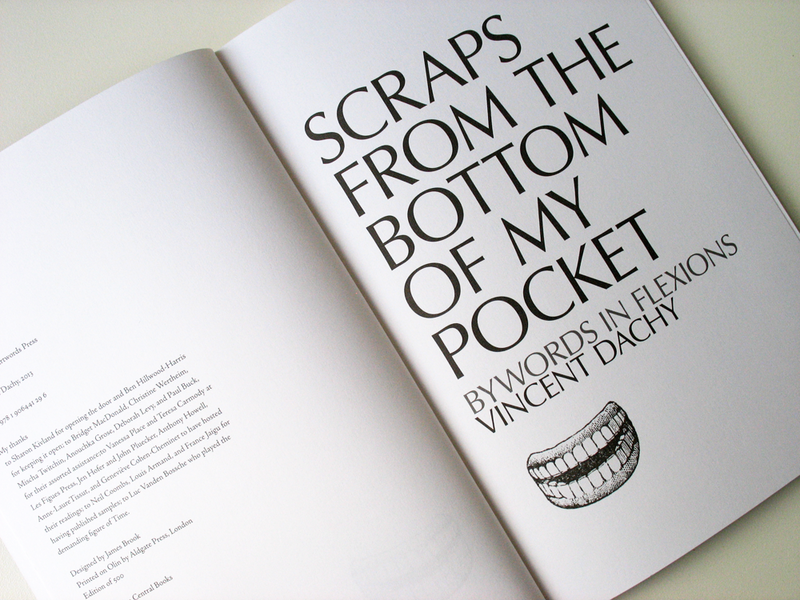 A similar design was used for 594 x 841mm posters that appeared outside Dovecot Studios. 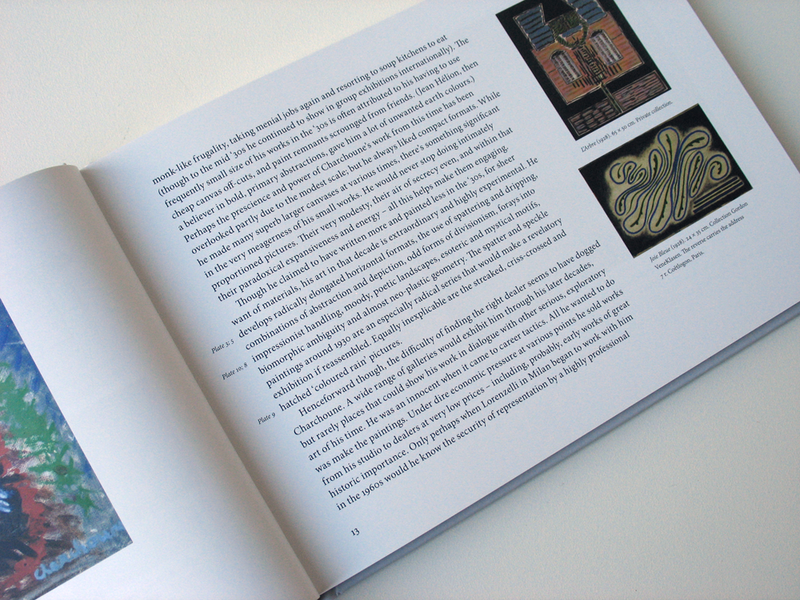 I worked closely with Kate Grenyer, Exhibitions Coordinator at Dovecot Studios on the graphics for the three exhibitions. 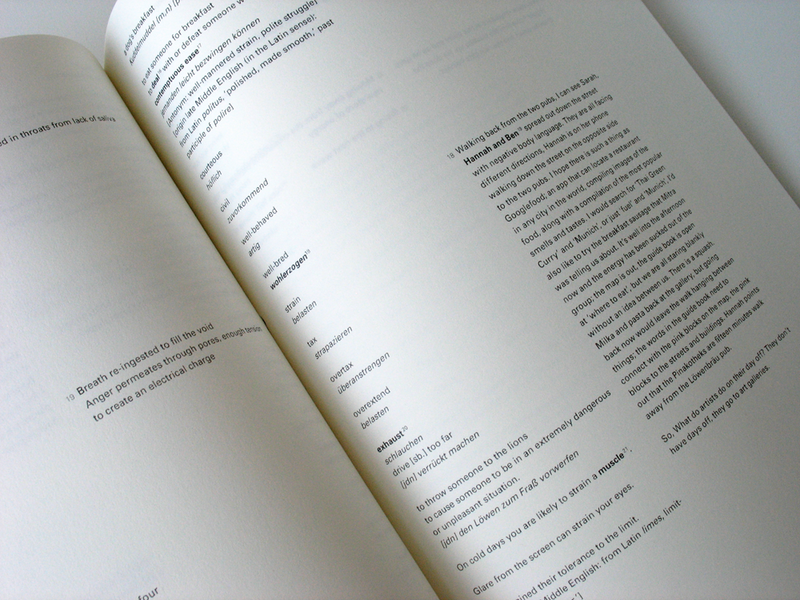 The size of the vinyl signage was determined by the spaces available in the galleries for these texts: I worked out an optimum size for the vinyl signs that could be applied to all of the available spaces. I then ran tests that looked at the best type size, line length and line-spacing for each vinyl sign. There were two types of vinyl signs, each carrying a different type of information: I designed these in two sizes, with the same layout but with a shift in type size to create a hierarchy of information. 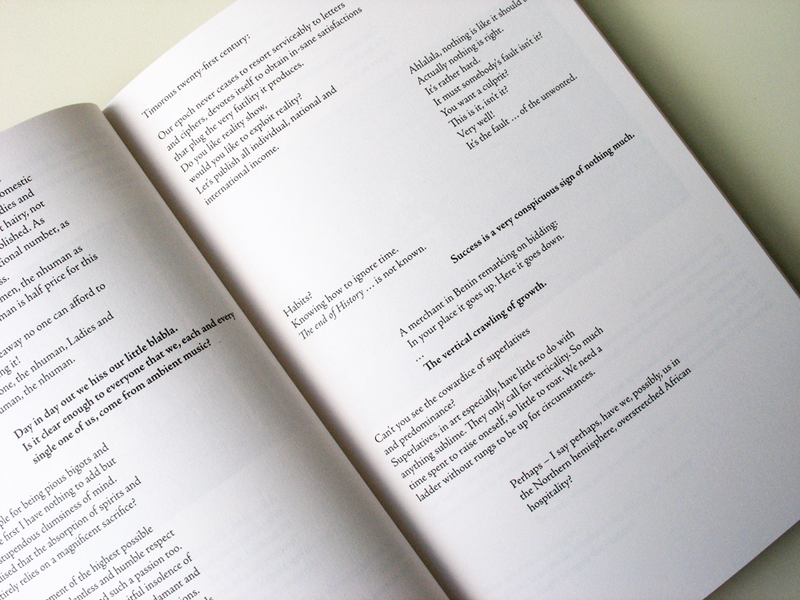 Univers was used throughout for consistency with the other printed material. The signs were laser cut from matt grey vinyl with a contrasting shiny gloss scribble logo in the appropriate colour for each exhibition. 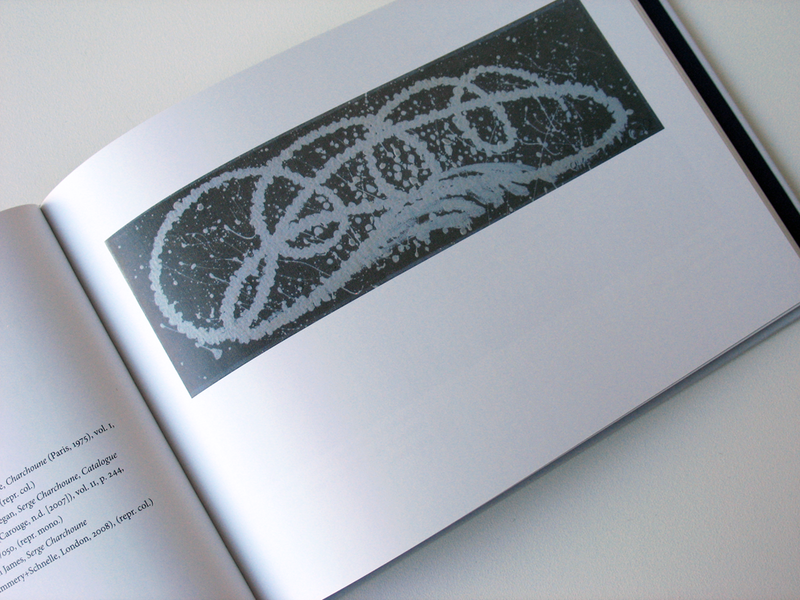 I designed labels for individual exhibits: they were typeset in Univers and had the scribble logo in the appropriate colour for that exhibition. The signs and labels were produced by Forrest Hepburn & McDonald Signs, Edinburgh. 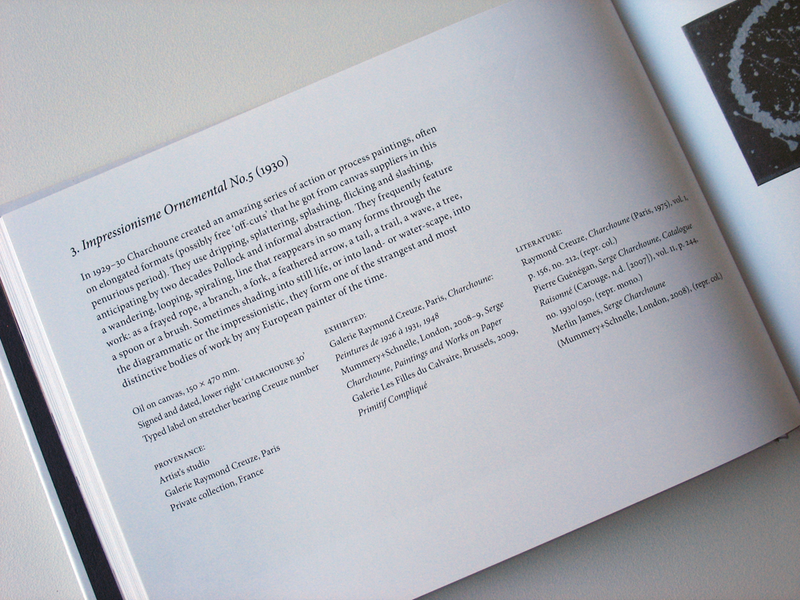 The graphics presented a rationalised, subtle identity that unified the three exhibitions whilst maintaining a sense of difference between them. As part of the development of the exhibition graphics, I designed a system of directional signs, based on the scribble logo, to direct visitors around the parts of the building. 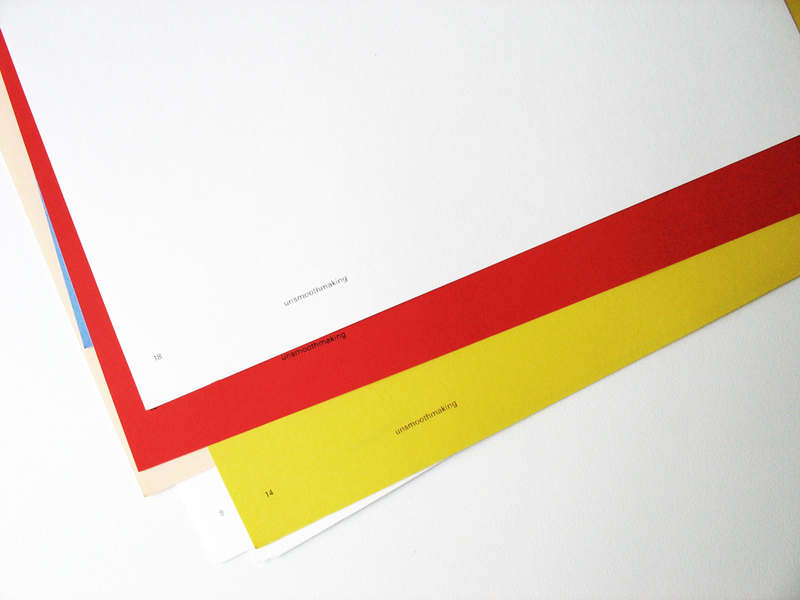 These were produced as vinyl signs, in eye-catching gloss colours that matched the colours of each exhibition. 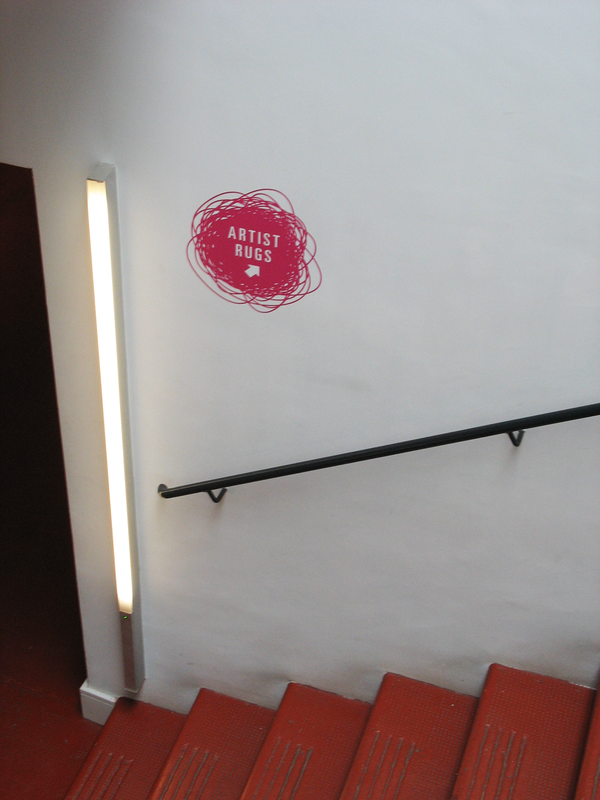 The signs were designed in two sizes: the larger ones announcing the exhibition entrances and the smaller ones appearing throughout the building to guide visitors up to the balcony gallery. Visitor feedback was very favourable and the scribbles were well-loved and admired. 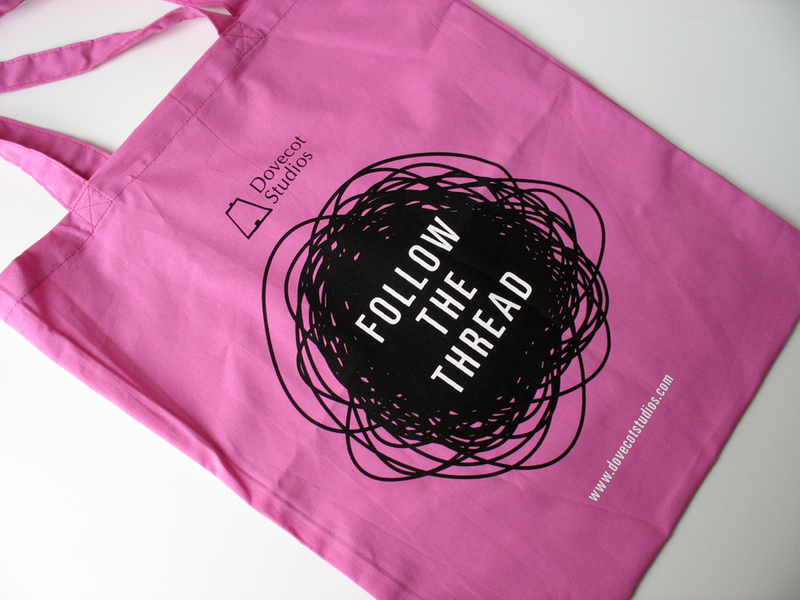 After the delivery of the invitation cards and leaflet, the scribbles proved to be very popular amongst the staff at Dovecot Studios, so Ross Christie, the Retail Coordinator, asked me to design a tote bag to sell during the exhibition. 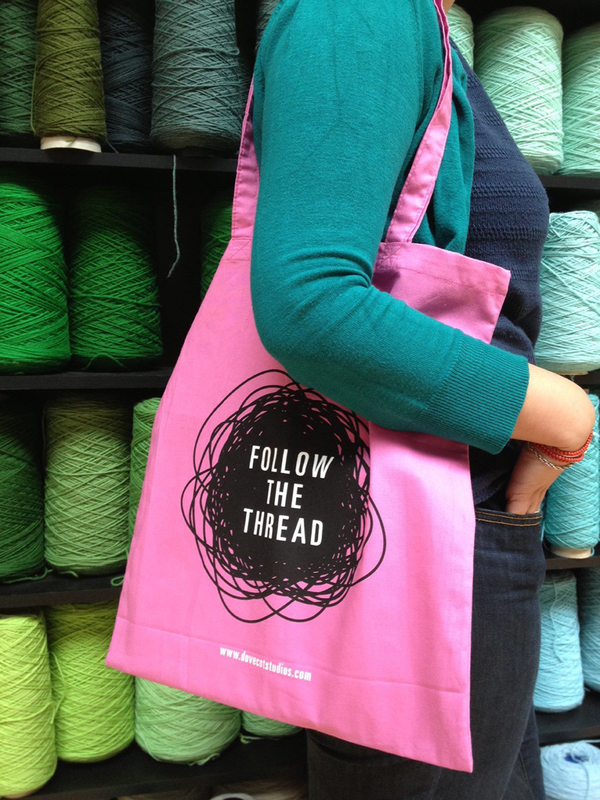 During the Festival, the bag became a highly visible advertisement for Follow the Thread – and for Dovecot. The bags were printed as a two colour screenprint on a pre-existing pink bag that, almost – but not quite – matched the colour of the invitation cards. 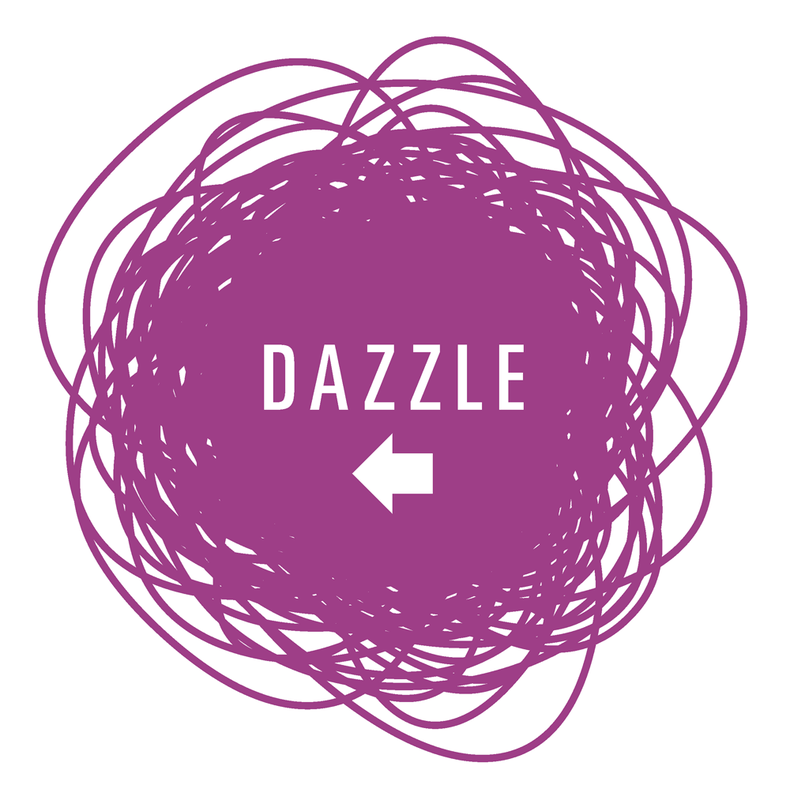 James was hired to create an exhibition identity package for us for our Summer 2013 Edinburgh Festival show. We have been extremely happy about the whole process and James has done a fantastic job. 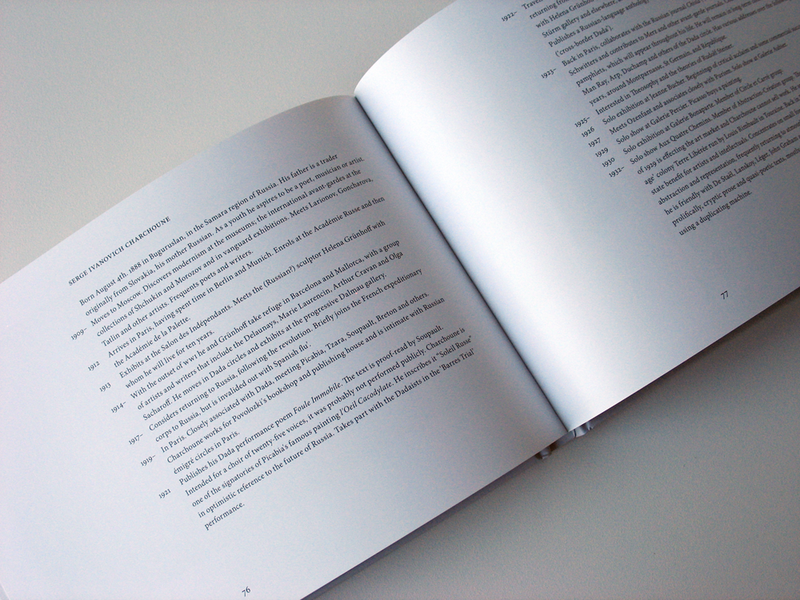 He was fast to deliver new ideas, open to collaborative working and provided us with work on time and under budget. James’s combination of creativity and professionalism was exactly what we needed. 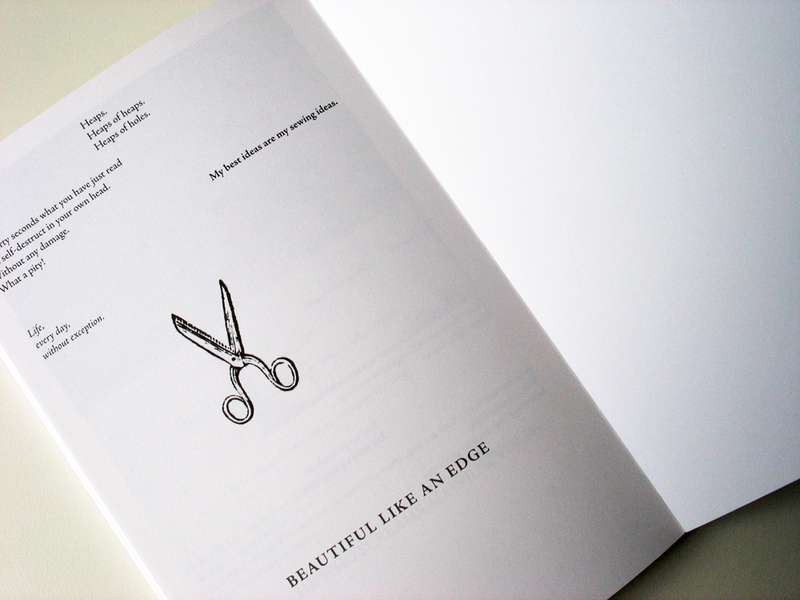 His work on the identity was very impressive and he gave us a number of great options to choose between. All of the options would have worked equally well and given the complex nature of the brief he was having to deal with this is no mean feat! 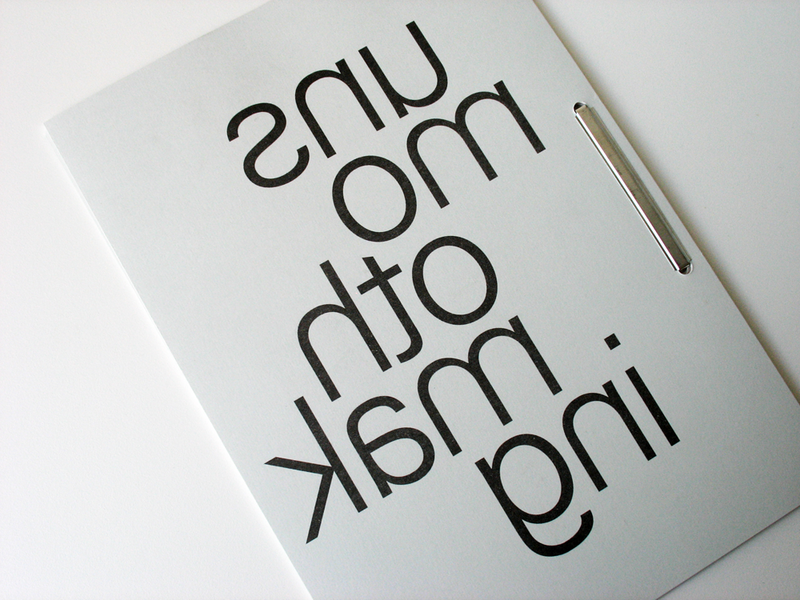 He truly is a designer with attention to detail, and very understanding of your needs. 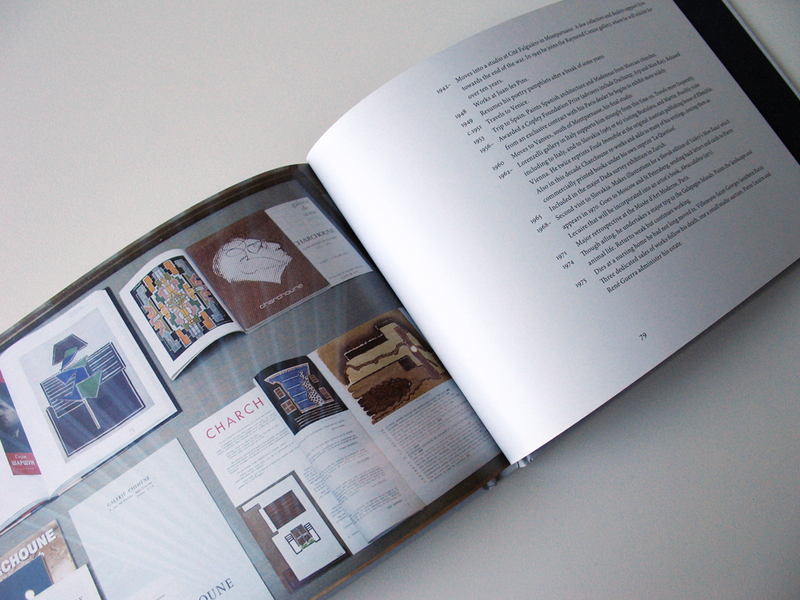 James has certainly helped us develop an exhibition identity that we can be proud of. 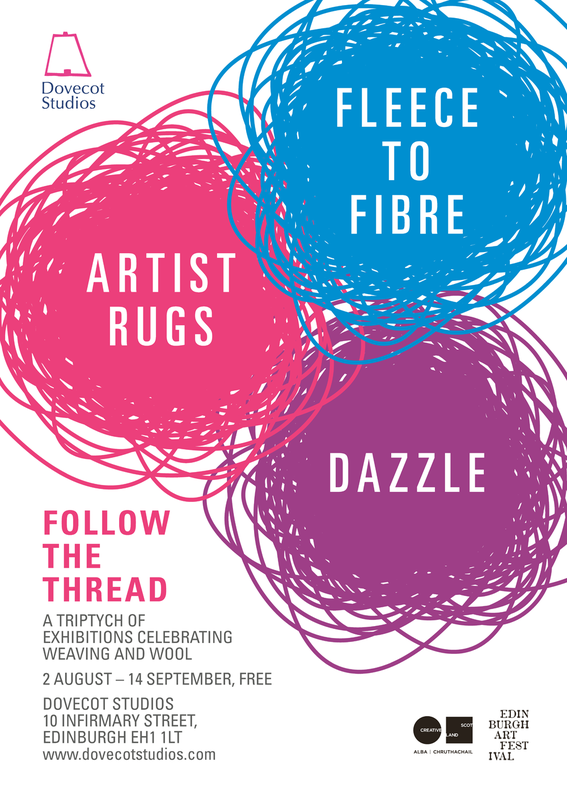 In fact James has helped us achieve the highest visitor figures for any Dovecot show in our 100 year history. He has been outstanding to work with all the way from the first contact to after the project was finished. I will not hesitate to use him again and I wholeheartedly recommend James as a designer.